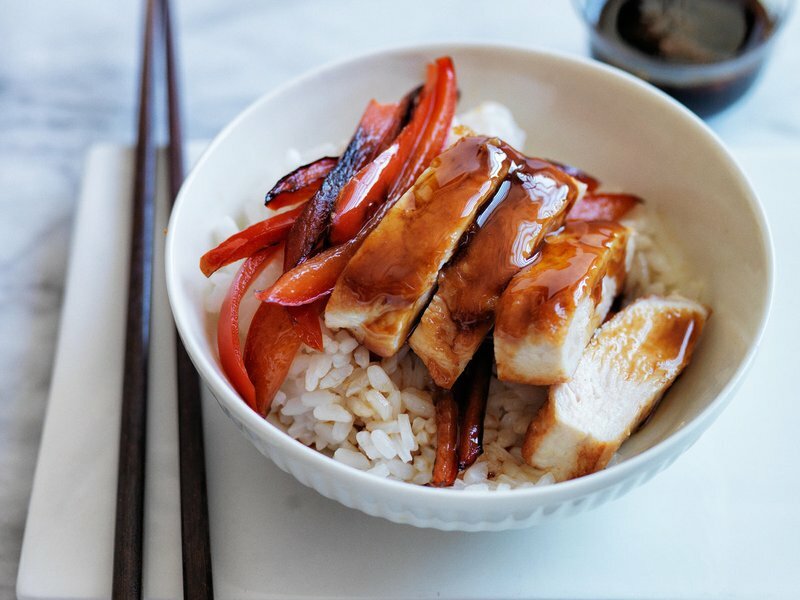 Nobu Matsuhisa's easy teriyaki sauce is made with chicken broth, soy sauce, sugar, mirin and sake. Nobu Matsuhisa’s teriyaki recipe couldn’t be simpler. He calls for boneless chicken breasts, but thighs would also be delicious. In a medium saucepan, combine the chicken stock with the soy sauce, sugar, mirin and sake and bring to a boil over high heat, stirring to dissolve the sugar. Reduce the heat to moderate and simmer until the teriyaki sauce is reduced to 1/2 cup and syrupy, about 20 minutes. Meanwhile, season the chicken with salt and pepper. In a large nonstick skillet, heat 1 tablespoon of the oil. Add the chicken and cook over moderately high heat, turning once, until browned all over and cooked through, 8 to 9 minutes. Transfer the chicken to a plate and let stand for 5 minutes. Wipe out the skillet. Add the remaining 1 tablespoon of oil and heat until shimmering. Add the pepper strips and cook over high heat, stirring occasionally, until crisp-tender and lightly charred, about 3 minutes. Transfer the peppers to plates. Slice the chicken breasts crosswise and transfer to the plates. 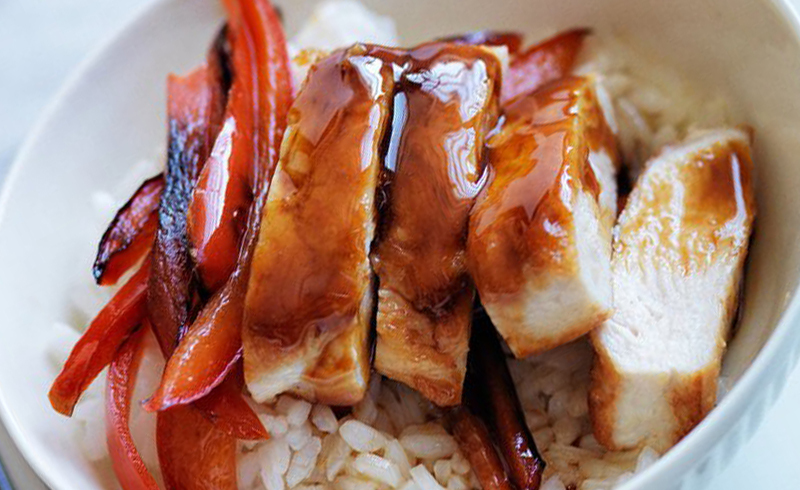 Drizzle the teriyaki sauce over the chicken and serve with rice. The teriyaki sauce can be refrigerated for up to 1 month.